This season Jason Basmajian took inspiration from the tropical look designed by Nino Cerruti in 1984 for the TV series “Miami Vice”. The collection that exudes chic and lightness, softening the boundaries between sportswear and tailoring. A palette of refreshing, pop rock shades – sangria, cream, lime, electric blue and ocean– joins forces with refined, natural fabrics, including cool wool cotton, silk, linen and ultralight nubuck, to create streamlined tailored pieces in a casual luxe and sporty mood. 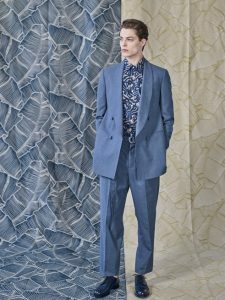 Tailoring, which the Cerruti man chooses for pleasure rather than out of a sense of obligation, takes on a related flowing silhouette this season. The oversized unlined double-breasted jackets are worn over T-shirts or V-neck shirts, with bermudas, or are simply swapped for loose easy summer coats. There is a playful mix of stripes, and a palm leaf pattern is worked into the collection in a variety of ways – printed on shirts, woven into knitwear, and on jacquard pieces – injecting a burst of pop energy into oversized silhouettes inspired by the 80s. The Cerruti logo in ultra-graphic form, is reinvented on T-shirts and sweatshirts. Denim comes into its own this season, too, in ultra-faded or striped versions, in the form of items given a new twist, like a jumpsuit or hooded poncho. As with the tailored wear, it is paired with colour-blocked sneakers, or suede lace up shoes or boots with natural rubber soles. The accessories encompass an array of XXL or compact bags, which come in a variety of shapes and sizes, ranging from a revisited beach tote bag in a mix of fabric and leather, to a canvas and calfskin army bag, to shoulder bags, and sunglasses with transparent, and coloured frames. Metal key chains with leather detailing add a final casual touch to jeans and tailored wear alike. A feature which, like the collection, conjures up the famous words of Nino Cerruti: “I want men to enjoy a greater sense of freedom in being elegant”.